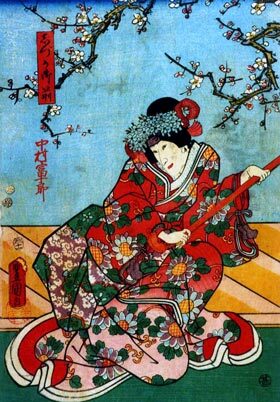 The play "Gosho Zakura Horikawa no Youchi" was originally written for the puppet theater (Bunraku) and staged for the first time in the 1st lunar month of 1737 in Ôsaka at the Takemotoza. It was adapted for Kabuki many years later and staged for the first time in the 4th lunar month of 1762 in Ôsaka at the Naka no Shibai [casting]. The roles of Iso no Tôyata and Shizuka Gozen were played by Fujikawa Hachizô I and Nakamura Kumetarô I. The "Tôyata Monogatari" scene was produced only a few times during the Edo period. It was revived in 1947 by Bandô Mitsugorô VII and, from this date, the role of Iso no Tôyata is closely related to the Bandô Mitsugorô line of actors. "Gosho Zakura Horikawa no Youchi" is a 5-act maruhonmono. The "Tôyata Monogatari" scene belongs to the fourth act. --> Other still performed act: "Benkei Jôshi". The story is set in the late 12th century during the civil wars between the Heike and Genji clans. Yoshitsune is a general on the Genji side but his wife, though in all other respects innocent, is the daughter of a Heike warrior. For this reason, Yoshitsune has been ordered to kill her and to submit her head as proof of his loyalty, something which he is loath to do. In the previous act, known as "Benkei Jôshi", his wife's life is saved by the substitution of another woman's head, and in this act she is disguised as a household maid to keep her identity hidden. To allay Genji suspicions yet further, Yoshitsune has installed his mistress in the household, the beautiful dancer Shizuka Gozen, and all seems well until Shizuka's brother, Tôyata, comes to visit. Tôyata is a rascal who has been disowned by his father, and although he has recently performed some service for which Yoshitsune is indebted to him, he is still in collusion with the evil general Kajiwara. On his current spying mission he realises the true identity of the maid, (i.e. Yoshitsune's wife), and is in the middle of writing to inform Kajiwara when Shizuka stops him and they fight. This does little good however, and it is not until their mother appears and stabs Tôyata that he has a profound change of heart, confesses his past sins and lets them know of an enemy attack due to take place that night. 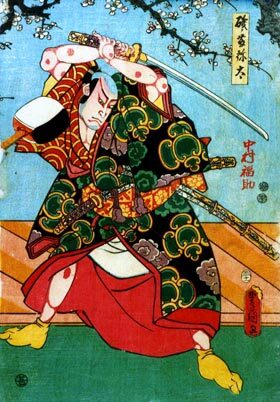 Tôyata's mother then reinstates him as a full member of the family and, though mortally wounded, Tôyata goes off to do battle with the enemy forces in a grand, tachimawari fight scene.